Whatever you do, don't waste your time reading this! 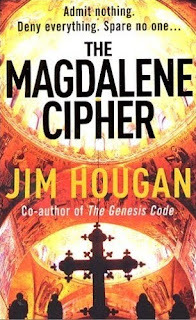 So anyway, what can I say about The Magdalene Cipher? Ah, don't read it? Don't buy it? One-dimensional charcters, done-to-death subject matter, tries to pull too many different conspiracies and theory's together, the plot had no momentum or oomph, and the ending? OMFG! What a disapointment! I was so pissed off with the ending. After enduring the nail-pulling that was the rest of the book it was just too much! And by that I mean it wasn't enough. It wasn't anything. It wasn't even a real ending! Thank God I got it as part of a 5 for $20 deal, otherwise I'd be even more annoyed with this book! Read The Genesis Code instead if you want a read something with a similar theme (the whole bloodline of Christ stuff), he wrote it under his other name, John Case. Just wanted to let you know that I really enjoy your book reviews. Thanks! Thanks DaniV. I figure most people don't want to read about themes and prose or whatever in a book review, if they are anything like me, I just wanna know if it was any good, was it intersting, fast-paced, etc. thanks for stopping by!